501 Squadron – Byron Leonard Duckenfield was born on 15th April 1917 in Sheffield. He joined the RAF on 25th November 1935 as a direct-entry Airman u/t Pilot. He did his elementary flying training at the Civil Flying Training School at Brough (4 E&RFTS). He was formally enlisted for four years in the RAF on 20th January 1936. Duckenfield moved on to 10 FTS Ternhill on No. 1 Course, which ran from 1st February to 8th August 1936. 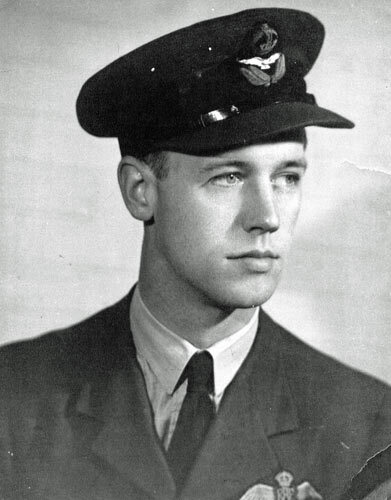 He was posted to 32 Squadron and was still serving with the squadron on the outbreak of war. Commissioned on 1st April 1940, he joined 74 Squadron at Hornchurch on the 6th and then moved to 501 Squadron at Tangmere on 5th May. The squadron flew to France on 10th May and Duckenfield followed with the rear party the next day in a Bombay transport. As it prepared to touch down at Betheniville the aircraft’s nose went up and the pilot went round again. On the second approach the same thing happened, the pilot appeared to lose control and the Bombay, L5813, went into a tail-slide and crashed. Three passengers were killed and six injured, including Duckenfield. He was treated at the Casualty Clearing Station at Epernay and sent back to Roehampton Hospital. He was posted to No. 1 RAF Depot Uxbridge as non-effective sick. 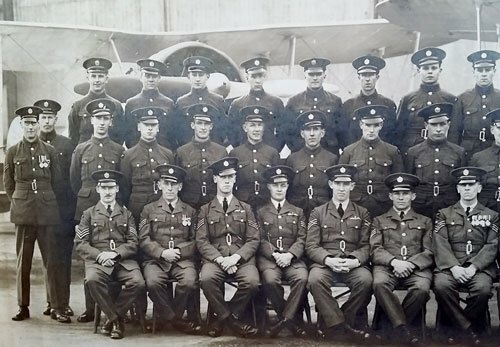 Left: Duckenfield, seated front row, third from left, with 32 Squadron. After convalescence Duckenfield rejoined 501, then at Middle Wallop, on 23rd July 1940. On the 29th he claimed a share in a Ju87 destroyed, on 16th August damaged a Do17, on the 28th destroyed a Me109 and on 8th September a Me110. Duckenfield was posted away to AFDU Northolt on 15th September 1940 on instructional duties and was awarded the AFC (gazetted 24th September 1941). In October 1941 he took command of 66 Squadron at Perranporth and in February 1942 615 Squadron at Fairwood Common. Duckenfield took the squadron to the Far East in March 1942. He failed to return from an attack on Magwe airfield on 27th December 1942. His engine failed over the target, he forced-landed in a creek and was captured by the Japanese.